Lincoln’s assassination in April 1865 sparked off a real shock wave in the United States as well as abroad. In France, as in the US, many Masonic institutions and Freemasons took initiatives to honor the memory of the great man, whose virtues were glorified and likened to Masonic values and were often based on the assumption that Lincoln was a Mason himself. However, French Freemasonry was highly politicized, and a close examination of the Masonic tributes to Lincoln also tells the story of a bitter political strife thinly veiled by the literary genre of eulogies, the fight of democracy against imperial rule. This fight of 1865 led to the creation of the Statue of Liberty, via the Lincoln medal. 1In spite of the numerous gaps in archival sources characteristic of the study of French Freemasonry, it has been possible to find quite a few of the early tributes to Lincoln. Most of the tributes we have consulted were sent to the Masonic Grand Lodge of New York. That Lincoln belonged to this American lodge (he never did) was mostly taken for granted. Some candidly explained that “brother Lincoln had been one of the most accomplished personifications of what a Mason should be, and we, French Masons, may claim him as one of us on the same grounds as the United States Lodges” (Girollet 12)—while others claimed that Lincoln possessed all the virtues actually symbolized during “initiation degrees” (La Chaîne d’Union 15.2 [15 May 1865]). 2Apart from this appropriation, tributes paid by French Masons had several dimensions: they expressed genuine grief for a man admired and causes shared, were familiar instances of civic participation, and also self-serving eulogies. Like all other forms of public tribute, they were also very political. French Freemasonry had always been extremely political. In that highly centralized, politicized and polarized country, any form of Masonic activity had to ask for, and receive protection from, the powers that be, and these powers kept a close eye on Masonic activities. Conversely, Freemasonry also served as a refuge and a greenhouse for opponents to the same powers. Right after the coup that put Napoleon III in power on December 2, 1851, the main Masonic body, the Grand Orient de France, had been placed under the thumb of Prince Lucien Murat as Grand Master. He was to check republican influence in an institution that had adopted the motto of the Second Republic (1848–1851), “Liberté, Égalité, Fraternité” as its own in 1849, and in which a good many republicans were awaiting better times, while others had been forced to exile. One of the major actions of Murat was indeed to change the constitution of the Grand Orient de France in 1854, moving the Republican motto Liberty, Equality, Fraternity from the first article to the third, eviscerating it of its radical message: “Freemasonry still retains its old motto ‘Liberty, Equality, Fraternity’; but it reminds its members that, since it works on the plane of ideas, one of their first duties, as Masons and as citizens, is to respect and obey the laws of the country where they reside” (Saunier 595). When the Empire became more liberal in 1862, and as a consequence of a rebellion against Murat’s dictatorial style, the Grand Orient de France was given more leeway under Marshal Bernard Pierre Magnan, who nevertheless remained a sentinel for the Emperor and tried unsuccessfully to unify all French Masonic bodies under his tutelage. Those Freemasons who were republicans were connected with their brethren exiles in London, who benefited from the freedom granted by the British crown, through the review La Chaîne d’Union, published in London until 1864, and then in Paris starting in 1865. 3As a consequence, the French Masonic bodies were battlegrounds for supporters of the regime and its opponents. In 1865 both used Lincoln’s story to substantiate their own political views. All this was done in the subdued style of Masonic symbolic expression and respectful phrasing, was connected to the myths and moral values that glued together Republicans and Bonapartists in the lodges under the banner of toleration. The initiative to honor Lincoln came from republicans. As soon as the news of the assassination was received, André Rousselle, a republican and one of the 33 members of the Conseil de l’Ordre (the governing body of the Grand Orient de France), proposed the adoption of a letter of condolences to be sent to the Grand Lodge of the state of New York. Rousselle read the final draft to the Conseil de l’Ordre, which adopted it on May 22, 1865, and the Grand Master, Marshal Magnan, endorsed the letter and signed it straight away, so that it could be sent immediately. This was one of his last acts as Grand Master as he died on May 29 and was replaced by Mellinet. (Bulletin du Grand Orient de France 110). 4As a matter of fact, Lincoln’s martyrdom had ended whatever speculation had existed on his character, while Appomattox had sealed the fate of the Confederacy, so that the Bonapartists had nothing to lose in following the movement of homage. In its meeting of May 17, 1865, the Bonaparte lodge, which had been established to provide a solid Bonapartist base in the Grand Orient, decided to circulate and publicize the speech given at the Grand Lodge of New York and veiled its banner for a period of three months (Bouvret 19–20). 5The Parisian lodges of the Grand Orient, each according to its orientation, reacted rapidly too, and the movement spread to the Provinces. The rival Suprême Conseil de France, which administered the higher degrees of the Scottish Ancient and Accepted Rite and had special ties with the U.S., didn’t want to fall behind. Its Sovereign Grand Commander, Jean-Pons-Guillaume Viennet, who was by no means a Republican, but who had also resisted both the civil and the Masonic coups d’état (the attempt of Magnan to unify French Freemasonry around the Grand Orient in April of 1862), also wrote a tribute to be sent to Lincoln’s widow (Memorandum du Rite Écossais). The mother lodge Arc-en-Ciel of another minority Masonic body, which had also resisted Magnan’s imperialism, the Misraïm Rite, held a Sorrow Lodge in the honor of “Very Illustrious Brother Lincoln,” a Masonic title reserved for holders of a certain degree, on May 16, 1865 (Hayère 1). 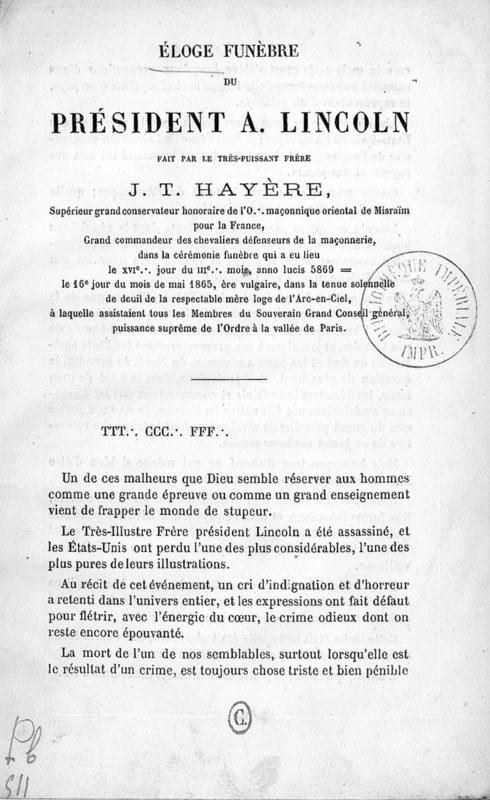 Hayère, J. T., Discours funèbre prononcé à la mémoire du président Lincoln, 1865, title page. Bibliothèque nationale de France, Paris. 6The tributes paid to the American president by French Freemasonry were unanimous in their condemnation of the murder that had cost Lincoln his life. Nothing could be less controversial—especially for members of an institution that called themselves “the children of the widow”—with a reference to the murder of Hiram, and were often addressing Lincoln’s widow. “In front of a grave such as that of Lincoln, all hearts must open and all heads must bow”, wrote La Chaîne d’Union (15 [15 May 1865]: 2), and its editor, Pierre Simard, in a letter sent to the American ambassador, depicted the murder as a most “horrible crime.” Many lodges used similar expressions: “horrifying assassination attempt”, “a most odious assassination”, a “loathsome murder” (Hayère 1–2). 7But the emphasis on the assassination of a Head of State also carried a political message since Napoleon III had escaped quite a few attempts on his life too. While the Bonapartists mourners were supporting the regime’s legitimacy, the republicans were dissociating themselves from the “terrorist” image of republicanism, which had been widely used by Bonapartist propaganda. In a more positive way, Lincoln’s assassination was a perfect occasion for them, as for French republicans in general: Lincoln’s image as a successful democratic leader, freely elected and reelected, committed to the moral cause of the extinction of slavery contrasted sharply with the figure of Napoleon III, the author of a coup who had consistently maintained a “neutrality” serving the Confederacy’s, and hence slavery’s interests. And since France was united in mourning the U.S. president, Lincoln eulogies were difficult to censor. 8The references to the horrible murder pictured Lincoln as another Hiram, the architect of the Temple of Solomon, who had chosen duty over life, therefore a universal figure. The speech given at the Grand Orient explained, among other things, that he was “one of those men who not only honor their own country, but in whom all mankind are entitled to take pride.” Staunch Republican Marie-Alexandre Massol regarded him as “the moral man par excellence” who evinced such Hiram-like virtues as “unfailing honesty,” “loyalty,” “courage,” “moderation,” “keen sense of justice,” “inflexible devotion to what was right,” “simplicity,” “admirable kindness”, “a model, a guide” (La Chaîne d’Union 15 [15 May 1865]: 2). 9In French republican lodges, the American president was also seen as embodying democratic ideals, which, once the blight of slavery had been removed, were recognized as the basis of the American republic. He was often portrayed as a worthy successor to Washington and Franklin because he, like them, “furthered the cause of progress and civilization.” The “private” man had in no way, therefore, “to be ashamed of his actions as a public figure.” Lincoln was also perceived as someone who progressed in the world thanks to nothing but his own efforts and who was able to reach “by the mere exercise of a strong and straight will the highest office in his great country, showing throughout his life both a keen sense of duty and an unshakeable serenity” (La Chaîne d’Union 14 [1 May 1865]: 1). Even in these carefully worded tributes, one was to read a comparison with Napoleon III, something that became very explicit in the more radical tributes. 10The “children of the widow,” i.e. Master Masons, not only lamented the assassination of Hiram, they took solace in the continuation of his work, in which they were engaged. But what was the equivalent work in the case of Lincoln? To French Freemasons, first and foremost, it was his fight against slavery. They indeed saw Lincoln as the man who had decided “that slavery should no longer bring disgrace on his country” (Bulletin du Grand Orient de France 137). Slavery as such was an important theme for French Freemasons in general and republicans in particular: they were very proud of the role “they” had played in the abolition of slavery in the French colonies in 1848 during the Second Republic, exemplified by the action of Freemason Victor Schœlcher, then Undersecretary for the Navy and the Colonies, who had played a major part in the process, and François Arago. Any form of antislavery agitation brought to their mind the figure of Schœlcher, a man who was forced into exile in Britain when Napoleon III seized power. But “slavery” was also a metaphor for the oppression of an antidemocratic regime, and raising Lincoln’s antislavery stand above other considerations was a way of defining Lincoln as a standard bearer for the republican cause. 11Those tributes distinguished Lincoln as a champion of democracy. La Chaîne d’Union attacked a parallel widely made in the press between the American president and Julius Caesar. Caesar, they said, was a “pale libertine” who “had killed freedom and crushed popular sovereignty under his feet”, while Abraham Lincoln “was neither a dictator nor an autocrat”: “He always remained the purest and most righteous representative of the energetic resolutions and inexhaustible resources of a great heroic nation.” In 1863, in his famous dictionary, Émile Littré had defined Caesarism as a system in which an elected official assumes absolute power, a clear reference to the Napoleons. The author of the article, Massol, remarked that Lincoln was “one of the purest and most faithful expressions of democracy,” adding that, “while Washington finally paved the way for true democracy, it was Lincoln that rendered it possible all over the planet and made it an ideal for every man” (La Chaîne d’Union 14 [1May 1865]: 1). 12The address drafted by the Grand Orient made it clear that, while, as Freemasons, its members should refrain from “assessing the political actions” of Abraham Lincoln, it was obvious that Lincoln never moved away from the “Liberty, Equality, Fraternity” Masonic motto, an attitude which made his example even more “valuable” (Bulletin du Grand Orient de France 136). It was indeed valuable to republican Freemasons that they had managed to get the Conseil de l’Ordre to assign to Lincoln, a republican, a phrase that was also the motto of the Second Republic, a double-entendre that they practiced regularly. 13Most remarkable for them was the fact that amid such exceptional and critical circumstances, and facing one of the most tremendous civil wars ever seen before, it never crossed Lincoln’s mind, as leader of the freest country in the world, that he should suspend the normal course of laws and place himself above them. He was as scrupulous as a guardian of freedom as he was energetic in the defense of equality. And just as fortune smiled on his efforts and crowned them with both glorious and legitimate success, the only words he uttered, after such a succession of ordeals and so much collective suffering, were words of peace, consolation and fraternity (Bulletin du Grand Orient de France 137). 14Charles-Louis Chassin was a republican historian who lived in Nantes and had published Le Génie de la Révolution. He was a founding member of the L’Avenir 168 lodge, who was later to play a part in the Commune de Paris. Chassin suggested a popular subscription—at 10 centimes per person—in order to offer Mary Lincoln, the president’s widow, an engraved gold medal. (Combes 65). He got in touch with the main local newspaper, Le Phare de la Loire, well-known for its opposition to the regime, and whose managing editor Léon Laurent-Pichat, was often brought to court for his attacks on the government and was defended by Etienne Arago, a scion of the famous freemason and republican family. Pichat was to join the Clémente Amitié lodge in 1876 (Mayeur 382). And was murdered on April 14, 1865. 16The project was accepted, and the medal was soon called the “medal of liberty,” while Le Phare de la Loire actively applied itself to collecting the subscriptions through a network of Republican and Masonic contacts. Leading opponents of the regime were early subscribers: Victor Hugo, Edgar Quinet, Jules Barni, and others. Several Republican Masons or Masons-to-be were members of the eighteen-member organizing committee, including Etienne Arago who, under the Restoration, had joined the Les Amis de la Vertu lodge; Louis Blanc, who had joined the London lodge Les Sectateurs de Ménès; polemicist Ferdinand Flocon who was a member of the Union des Peuples lodge; republican Eugène Pelletan who had been recently admitted to the Loge de l’Avenir; and Victor Schœlcher himself, who had been initiated before 1848 into the Loge des Amis de la Vérité and was living as an exile in London (Ligou 62, 143, 464, 715, 1105,).To this list one could also add the philosopher and lexicographer Émile Littré, although he was to be initiated into the lodge La Clémente Amitié only ten years later. The campaign to collect funds, though frustrated by the regime’s police, lasted until April 1866 and successfully achieved its goal. 17The final medal, the work of Franky Magniadas, differed slightly from the original idea as the illustrations are concerned (it includes an American Eagle, Masonic symbols and an allegory of emancipation). The cast is now in the Library of Congress. 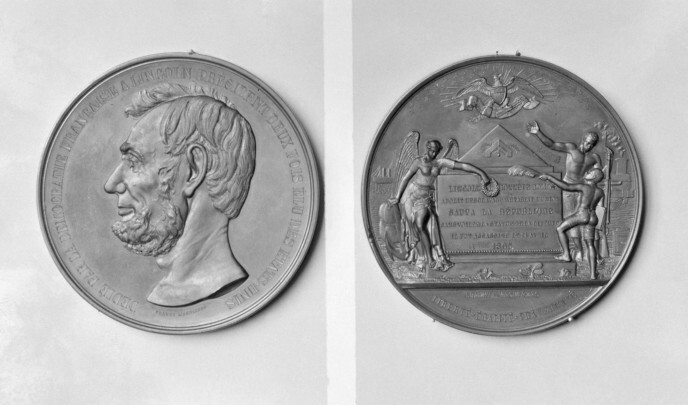 Franky Magniadas, “In Memory of President Lincoln,” 1865, bronze medal 3 1/4″ (83 mm) diameter, www.metmuseum.org. 18After the end of this campaign, the republican interest in Lincoln was lost for Freemason as for non-Mason republicans. What remained was the uncontroversial side of Lincoln as the legendary Hiram, whom all Freemasons had revered. Since many French Masons were Protestants, and since Freemasonry was first and foremost a school of morality, while the translation of moral values into political values was a perennial problem, they had a better understanding of Lincoln’s character than most Frenchmen: extolling his moral values and his religious style was natural for them. Casting Abraham Lincoln as civil saint resonated with the asepticized version of Lincoln that has sometimes prevailed in the United States after his assassination and which is definitely the one France has remembered. Thus, the importance of the Masonic involvement in the celebration of Lincoln, with their insistence on the moral theme, might well have played a part in the enduring image of Lincoln as essentially a moral saint. Another proof that, as Herndon, quoting Holland, remarked, “men caught only separate aspects of his character—only the fragments that were called into exhibition by their own qualities”—something that holds true for all visions of Lincoln, American or foreign (Herndon 3: 584). 19On the other hand, the long-lasting fight for democracy by republicans within French Freemasonry, of which the Lincoln tributes is a landmark, help us understand why there is a statue of liberty in New York harbor. While not a Mason until 1875, Auguste Bartholdi took an active part in the 1865 campaign for the Lincoln medal. He was eventually to give a monumental shape to the “Statue of Liberty” that Lincoln had not veiled, the very statue that graces New York harbor, and he explicitly connected the two enterprises (Berenson 11–12). This paper is based mainly on archival research. Several of the tributes can be read (with an English translation) at archive.org. The standard reference for the history of Freemasonry in France during this period is Pierre Chevallier, Histoire de la Franc-Maçonnerie française, vol. 2, La Maçonnerie, missionnaire du libéralisme (1800–1877), Paris, Fayard, 1974. Berenson, Edward. The Statue of Liberty. A Transatlantic Story. New Haven: Yale UP. 2012. Print. Bouvret, Alphonse. Historique de la loge “les Amis Triomphants.” Paris: E. Compiègne. 1899. Print. Bulletin du Grand Orient de France (May 1865). Print. La Chaîne d’Union. 14–15 (1865). Print. Combes, André. La Commune de Paris (mars–juin 1871): La Franc-Maçonnerie déchirée. Paris: Dervy. 2014. Print. Gastineau, Benjamin. Histoire de la souscription populaire à la médaille de Lincoln, la médaille de la liberté, avec des lettres de Flocon, Edgar Quinet, Victor Hugo, Schoelcher, Louis Blanc, et la vie d’Abraham Lincoln. Paris: A. Lacroix et Verboeckoven, 1865. Print. Girollet, Anne. Victor Schoelcher, républicain et franc-maçon. Paris: Edimaf. 2000. Print. Hayère, J. T. Discours funèbre prononcé à la mémoire du président Lincoln par le Très Puissant Frère Hayère […] dans la tenue solennelle de deuil de la respectable mère loge l’Arc-en-Ciel […]. Paris: Martinet, 1865. Print. Herndon, Wiliam H., and Jesse Weik. Herndon’s Lincoln: The True Story of a Great Life, 3 vols. Chicago: Bedford, Clarke, 1889. Print. Mayeur, Jean-Marie, Alain Corbin, and Arlette Schweitz. Les immortels du Sénat, 1875–1918: Les cent seize inamovibles de la Troisième République. Paris: Publications de la Sorbonne. 1995. Print. Memorandum du Rite Écossais Ancien et Accepté. Paris, 1865. Print. Saunier, Éric, ed. Encyclopédie de la Franc-Maçonnerie. Paris: Librairie Générale Française. 2000. Print. Olivier Frayssé is Professor of Language, Literature and Civilization of Anglophone countries at Paris Sorbonne University. He has published extensively on U.S. history and culture, notably on Lincoln: Lincoln, Land and Labor, 1809–1860, trans. Sylvia Neeley, Urbana: U of Illinois P, 1994, and, on Lincoln’s early connections with freemasonry, “Chicago 1860: A Mason’s Wigwam?” Lincoln Herald 87.3 (Fall 1985): 71–72. Laurence Grégoire holds a Ph.D. in History from Paris Sorbonne University. Her doctoral dissertation was on French Freemasonry under the Second Empire (1852–1870). She is the author of “La franc-maçonnerie parisienne (1852–1870),” Parlement[s], Revue d’histoire politique 3 (2008): 98–115, cairn.info, web, 9 April 2016. Frayssé, Olivier, and Laurence Grégoire. “The French Masonic Tributes to Abraham Lincoln.” American Studies Journal 60 (2016). Web. 24 Apr. 2019. DOI 10.18422/60-10.